With just hours away from Google’s Moto X launch event today, Motorola Connect extension has showed up in the Chrome Web Store, offering a sneak peak on what it will appear as and what’s its functionality on offer. The extension – spotted by Android Police – lets device owners the ability to read text messages and review incoming calls via Chromebook or the Chrome browser. 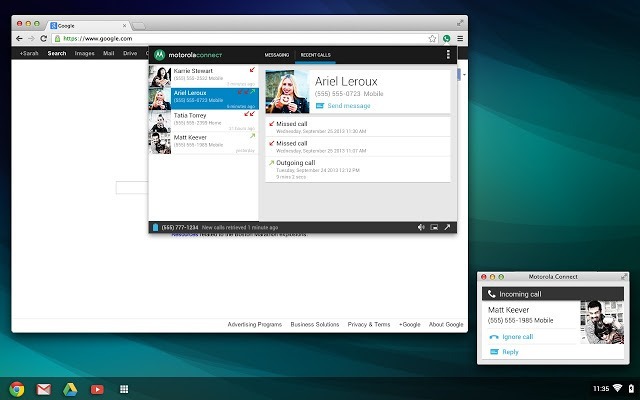 Motorola Connect allows you to see text messages and calls coming into your Connect enabled phone on your computer’s Chrome browser. You can read and respond to texts using your keyboard and even know who’s calling before deciding if you should reach for your phone. Motorola Connect is currently supported on Moto X, DROID ULTRA, DROID MAXX and DROID MINI.